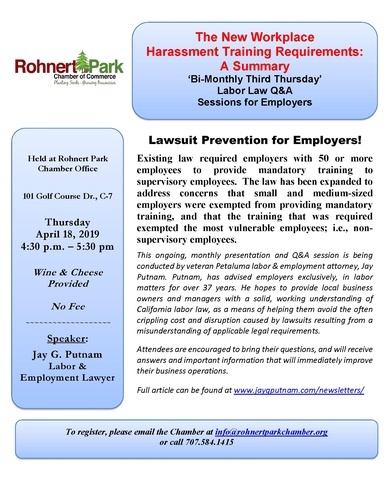 Join the Rohnert Park Chamber of Commerce for a free Labor Law Workshop presented by Jay Putnam, Attorney at Law. Each presentation is followed by a Q&A session for attendees. These workshops are free and open to all, and wine and cheese appetizers are provided. Come join us! Our Labor Law Workshops take place on the third Thursday of every other month at the Chamber of Commerce office from 4:30-5:30p. This event is free to attend and open to members and non-members alike. Come join us!